Vancouver, B.C. – Corvus Gold Inc. (“Corvus” or the “Company”) - (TSX: KOR, OTCQX: CORVF) announces a new resource update incorporating all drill results from 2012 and 2013 at its 100% owned North Bullfrog Project, Nevada. This resource calculation is the first to incorporate drill results from the expanding Yellowjacket Deposit and is the first quantified estimate of its potential grade impact on the overall project (Table 1 & 2). The high-grade Yellowjacket Deposit is a mineralized corridor between two major faults currently defined by the Josh Vein on the west and the Liberator Fault on the east. The Josh Vein has been drilled on 50 metre fences for approximately 600 metres along strike to an average vertical depth of 120 metres and accounts for the bulk of the indicated resource at Yellowjacket (Table 1). All of the 125,000 indicated ounces of gold and 800,000 ounces of inferred gold at 0.3 g/t cutoff in the Yellowjacket Deposit are new additions to the previous resource estimate and could have a major impact on future mine plans due to their higher gold and silver grade. The Yellowjacket structural zone has further potential to host more vein systems similar to the Josh Vein both to the west and east which will be tested during the current phase of exploration. The Yellowjacket Deposit remains open along strike in all directions including down dip. The depth potential is best reflected by hole NB-13-370, drilled in late 2013 towards the northern extension of the zone, to a down dip extent of 170 metres, which intersected one of the best vein intervals drilled to date near the bottom of the hole (4.9m @ 21.2 g/t gold & 117.0 g/t silver). The Company’s current 2014 drill program is targeting the extension of the Yellowjacket Deposit and prospective high-grade vein systems within the deposit area. At present Yellowjacket and the disseminated resources are being calculated with different cutoff grades because of differences in the gold deportment. The gold at Yellowjacket occurs as native gold and silver sulfides in quartz veins occurring within a major District scale structural zone. Initial metallurgical test work show gold and silver are readily cyanide soluble and work is ongoing to determine how to most effectively maximize extraction. A NI 43-101 report on this new resource update will be filed on Sedar within 45 days. Giroux Consultants Ltd., of Vancouver BC, has produced the updated mineral resource estimate (effective as at 23 February, 2014), based on resource drilling in the Sierra Blanca and Yellowjacket areas of the District that occurred in 2012 and 2013. The new resource calculation includes an additional 16,209 samples derived from 111 holes totalling 23,020 metres with an average depth of 207 metres. The resource also incorporates an updated geologic model and additional rock density data. Previous resource estimates from the Jolly Jane, Mayflower and Connection deposits have not been updated in this report because no additional drilling has been conducted in those resource areas. The locations of individual resource areas are shown in Figure 1. The structurally controlled mineralization in the Yellowjacket Zone was modelled separately in several geologically defined domains to prevent smearing of high-grade mineralization into the surrounding blocks. However, the resource for the complete zone is reported as a single entity because of the geological similarities (Tables 1 and 2). Because the structurally controlled mineralization is mineralogically and texturally distinct from the disseminated mineralization a different cut-off grade was deemed appropriate. The disseminated mineralization at Sierra Blanca was also modeled in a series of discrete volumes to prevent grade from smearing across certain important grade controlling faults. The North Bullfrog district-wide global oxide resource includes five deposit areas, Sierra Blanca, Air Track West, Jolly Jane, Mayflower and Connection. These deposits are characterized by broad tabular bodies of at or near surface, with low-grade disseminated, oxidized gold and silver mineralization. The current disseminated oxidized mineral resource, based on a cut-off grade of 0.1 g/t gold (“COG”), is listed in Tables 3 and 4. The 0.1 g/t cutoff was established in the PEA published in October of 2013. There is disseminated sulphide material below the oxide zone and a resource has been estimated for that part of the deposit (Table 5). The Yellowjacket, Sierra Blanca and Jolly Jane deposits remain open and are current exploration targets for the Company in 2014. In addition to the major new Yellowjacket Deposit there has been a general increase of 7% in the inferred ounces of gold in the low-grade oxidized disseminated resource (Tables 3 and 4). The project low-grade oxide resources (excluding Yellowjacket) is, Indicated 307,860 ounces gold @ 0.26 g/t gold and 443,230 @ 0.68ounces silver and inferred 1,366,000 ounces gold @ 0.18 g/t and 4,873,000 ounces silver @ 0.38 g/t silver. Total Inferred sulphide resources are 1,117,000 ounces gold @ 0.16 g/t gold and 4,250,000 ounces silver @ 0.62 g/t. Figure 1: Corvus land position at North Bullfrog with resource areas shown. The Yellowjacket resource area is immediately east of the Sierra Blanca deposit and was modeled as a specific zone within the greater Sierra Blanca deposit. The zone has a North-Northwest trend and is currently defined by the Josh Vein on the west and the Liberator Fault on the east. This zone includes vein and stockwork vein type mineralization controlled by the interaction of the two structures. While the main vein drilled to date has a NNW trend, the step over structures between the main faults appear to have a north-easterly trend. Although the bulk of the indicated mineralization within the current resource is hosted by one vein system three others have been intersected with the drilling and will be further explored with the ongoing exploration program. 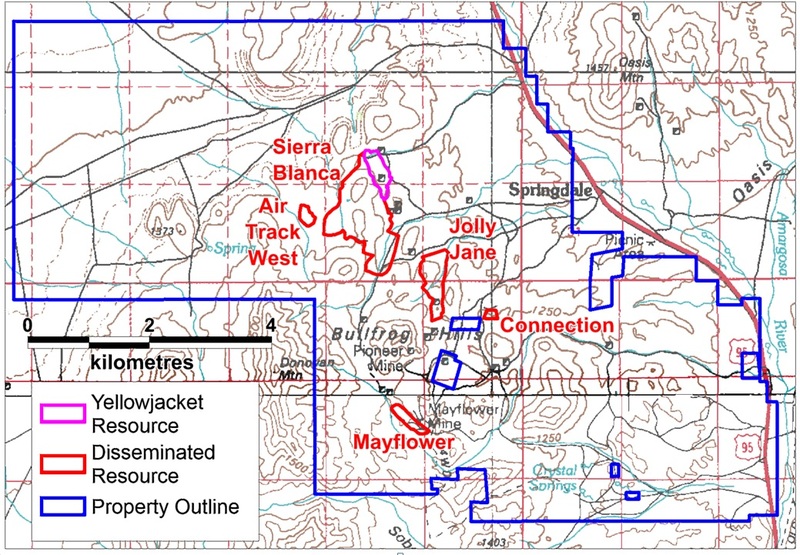 The project currently includes numerous prospective gold targets with five (Sierra Blanca, Air Track West, Jolly Jane, Mayflower and Connection) containing an estimated Oxidized Indicated Resource of 36.7 Mt at an average grade of 0.26 g/t gold for 307,860 ounces of gold and an Oxidized Inferred Resource of 242 Mt at 0.18 g/t gold for 1,366,000 ounces of gold (both at a 0.1 g/t gold cutoff), with appreciable silver credits. Unoxidized Inferred mineral resources are 213 Mt at 0.16 g/t for 1,117,000 ounces of gold (at a 0.1 g/t gold cutoff). The Yellowjacket Zone represents a different structurally controlled vein-style mineralization and at a 0.3 g/t cut-off grade contains an Indicated Resource of 4 Mt at an average grade of 0.97 g/t gold and 5.15 g/t silver for 125,000 ounces of gold and 662,000 ounces of silver. At the same cut-off grade Yellowjacket also contains 35,580 Mt with an average grade of 0.7 g/t gold and 3.86g/t silver for 800,000 ounces of gold and 4.4M ounces of silver. Mineralization occurs in two primary forms: (1) broad stratabound bulk-tonnage gold zones such as the Sierra Blanca and Jolly Jane systems; and (2) moderately thick zones of high-grade gold and silver mineralization hosted by structural zones with breccias and quartz-sulphide vein stockworks such as the Yellowjacket target. The Company is actively pursuing both types of mineralization. Mr. Scott E. Wilson, CPG, President of Metal Mining Consultants Inc., is an independent consulting geologist specializing in Mineral Reserve and Resource calculation reporting, mining project analysis and due diligence evaluations. He is acting as the Qualified Person, as defined in NI 43-101, for the description of the general site information, the mineral exploration, and the site geology portions of the Report. Mr. Wilson has over 23 years experience in surface mining and is a Registered Member of Society of Mining, Metallurgy and Exploration. Mr. Wilson and Metal Mining Consultants, Inc. are independent of the Company under NI 43-101. This press release contains forward-looking statements and forward-looking information (collectively, “forward-looking statements”) within the meaning of applicable Canadian and US securities legislation. All statements, other than statements of historical fact, included herein including, without limitation, statements regarding the anticipated content, commencement and cost of exploration programs, anticipated exploration program results, the discovery and delineation of mineral deposits/resources/reserves, the potential for higher silver grades to have a beneficial effect on anticipated production costs when included in the updated North Bullfrog Preliminary Economic Assessment, the potential to develop multiple Yellowjacket style high-grade zones and to expand the Yellowjacket deposit at depth, the potential for the Company to be entering new area of the system which may hold potential for higher grades and significant expansion of the North Bullfrog District scale discovery, the potential for the discovery of a new, large Bullfrog type high-grade gold and silver system, the potential to discover additional high grade veins or additional deposits including the potential for a large target to exist beneath the currently defined oxide deposit, the potential to expand the existing estimated resource at the North Bullfrog project, the potential for the North Bullfrog system to continue to grow and/or to develop into a major new higher-grade, bulk tonnage, Nevada gold discovery, the potential for any mining or production at North Bullfrog, the potential for the identification of multiple deposits at North Bullfrog, the potential for the existence or location of additional high-grade veins, the planned completion of an updated preliminary economic assessment for the North Bullfrog project, whether in Q2 2014 or at all, the potential for the Company to secure or receive any royalties in the future, business and financing plans and business trends, are forward-looking statements. Although the Company believes that such statements are reasonable, it can give no assurance that such expectations will prove to be correct. Forward-looking statements are typically identified by words such as: believe, expect, anticipate, intend, estimate, postulate and similar expressions, or are those, which, by their nature, refer to future events. The Company cautions investors that any forward-looking statements by the Company are not guarantees of future results or performance, and that actual results may differ materially from those in forward looking statements as a result of various factors, including, but not limited to, variations in the nature, quality and quantity of any mineral deposits that may be located, variations in the market price of any mineral products the Company may produce or plan to produce, the Company's inability to obtain any necessary permits, consents or authorizations required for its activities, the Company's inability to produce minerals from its properties successfully or profitably, to continue its projected growth, to raise the necessary capital or to be fully able to implement its business strategies, and other risks and uncertainties disclosed in the Company’s 2013 Annual Information Form and latest interim Management Discussion and Analysis filed with certain securities commissions in Canada. All of the Company’s Canadian public disclosure filings may be accessed via www.sedar.com and readers are urged to review these materials, including the technical reports filed with respect to the Company’s mineral properties.